Spotting scopes are scopes used by hunters and birdwatchers to find animals. Many spotting scopes can be turned into digital telescopes for photography. Both angled, and straight spotting scopes have their advantages and disadvantages. Depending on what you're going to be looking for, you may prefer an angled or a straight spotting scope. Let’s take a look at the pros and cons of each style of scope. 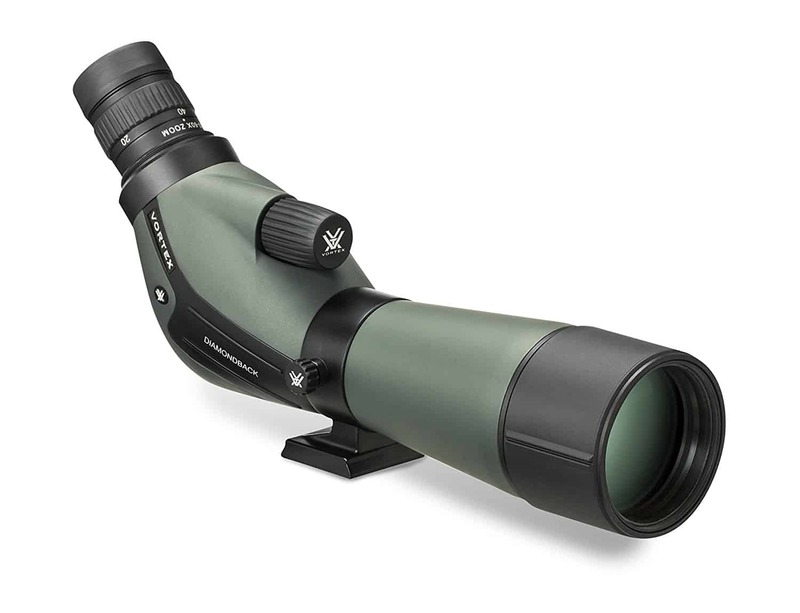 Angled spotting scopes have a 45° angle instead of the flat 180° of a straight spotting scope. You look down into an angled spotting scope instead of straight. 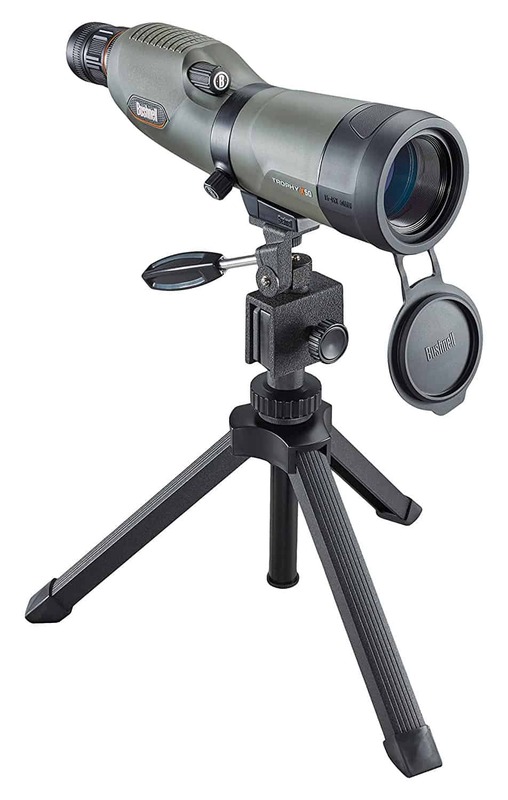 This ergonomic design makes it easier for multiple people in a party to use the spotting scope without making adjustments to the tripod. In addition to multiple people being able to use the angled spotting scope, the ability to have the spotting scope lower on the tripod increases the stability. Having a more stable scope allows for an easier sighting of your target. This also can lead to fewer accidental damages to your spotting scope. Click here now to find the lowest price for the Vortex﻿ Optics ﻿﻿﻿﻿﻿Diamondback Spotting Scope on Amazon! With an angled spotting scope, you can track targets higher in the sky easier. Tree targets and flying targets are much easier to spot with an angled spotting scope. This is especially true if you are at a lower elevation than the area you wish to spot, like in a canyon looking upwards. If using a car window mount with your angled spotting scope, it’s easy to rotate the angled viewfinder so that you can view straight out of the car. You can also look up in the sky with an angled spotting scope from a car mount much easier than you can with a straight spotting scope. One problem many people find is that in poor weather angled spotting scopes will collect snow and liquid on the lens. Even in good weather during early morning hours angled spotting scopes may collect dew on the lens which can interfere with the view finding. Depending on where you’re hiking an angled spotting scope can be difficult to fit into a backpack. It can also become cumbersome trying to attach it to the outside of a pack. Losing space in your bag when you pack an angled spotting scope can be made up for with the use of the smaller tripod. Packing a smaller tripod with an angled spotting scope can even out the packing difference between the angled spotting scope and the straight spotting scope. Straight spotting scopes are designed so that the objective lens and the ocular lens form a straight line. Hence the name, straight spotting scope. Because straight spotting scopes form a direct line from the eye to the objective lens, many people find that they are easy to use. One of the advantages of using a straight spotting scope is the ability to track moving targets. Because you're viewing the target in a straight line from your eye to the objective lens, you can track targets looking down with ease. Targets moving down a ridge line are much easier to follow with a straight spotting scope. Click here now to find the lowest price for the ﻿Bushnell Trophy Xtreme Spotting Scope﻿ on Amazon! Straight spotting scopes are easier to move in confined spaces. This makes them great for car mounting. They can also be easier to digiscope from a car because of the position of the camera. If you plan on doing a lot of car mounting for your spotting, then you definitely want a straight spotting scope. A straight spotting scope can be a disadvantage when looking at extreme uphill angles. You will not be able to look at very high targets without some very strange body movements and contortions. Straight spotting scopes are not ideal for birding or finding targets that have gone up in a tree. Straight spotting scopes have a limited ability to look upward when car mounted when compared to an angled spotting scope. If you plan on stargazing from a car mounted spotting scope, the straight spotting scope is not going to work for your needs. Finally, you should purchase a taller tripod which can make the straight spotting scope unstable. Taller tripods can be more expensive. The taller the tripod, the more movement the glass is likely to make when there is slight wind. Which spotting scope best used for what? Each style of spotting scope has its own unique characteristics. Depending on your personal preference and height you may find that one style works better over the other. Here are some common uses that each style spotting scope is used for and may perform better at. No matter what you decide to use your spotting scope for, make sure it fits your needs. If you primarily plan on birding, don’t get a straight spotting scope. You’re not going to be happy with the results. Most of your time will be spent in an unnatural and uncomfortable position. The same goes for hunting from a tree stand. If this is where you plan to use your spotting scope, get a straight spotting scope. You’ll be able to look down with ease, and you won’t be hindered by the angle found in an angled spotting scope. Since each of the styles perform equally in sighting ability, it comes down to what you’re going to use this scope for. Once you know your primary usage, it’s an easy choice on which style of spotting scope you need. These are great additions to have for any outdoorsman's gear, and you won’t regret purchasing a spotting scope. They can truly enhance your outdoor experience when hunting, birding, and observing your natural surroundings.